In December, 2011 I wrote about Bernie Silver on the occasion of his funeral. He served in World War II. His story is one of many millions of the Greatest Generation. On this Veterans Day, where we honor the men and women who serve in the Army, Navy, Marines, Coast Guard and National Guard, it seems appropriate to recall the story, which is a great story of America. And this Veterans Day I will honor members of my family who served, including my daughter Gabrielle (Lt. Col. USA) and her husband Kurk (Captain, USA) and my daughter’s dear friend Jason (Captain, National Guard), all of whom make me very proud. On Sunday, December 4, three days before the 70th anniversary of Pearl Harbor, we came to bury Bernie Silver. He was 95 years old. I, as his son-in-law, was honored to be able to say a few words. Since the funeral, Bernie is still very much on my mind. Bernie was married twice (his first wife Shirlee died of cancer). He had three children who adore him, Barbara, Shoshana (my wife), and Mark. He lived to enjoy his grandchildren and great grandchildren. Ina, his second wife, cared for him and helped him as he grew older even though she also had to fight cancer, a major heart attack and operation, and other medical ills. When the war came he enlisted, like tens of thousands of other young men. So, too, his brother Ray. His other brother, who had physical problems, could not serve. He served in North Africa, in Italy, in France and into Germany. 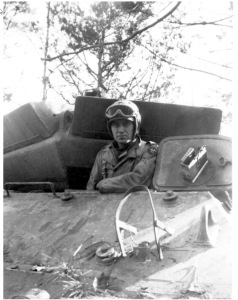 In the last phase of the war, he was commander of a tank destroyer, an M-10. The M-10, based on an older Sherman tank chassis, had a 76mm (3 inch) gun with special shells capable of stopping German Panzer tanks. He was at the landing at Anzio, a particularly bloody and messy affair. On the Allied side there were 43,000 combat casualties (7,000 killed, 36,000 wounded or missing). On his war record you will see that he had the European, Middle Eastern and North African medal with the bronze arrow device, signifying the Anzio landing. Along the way, Bernie receive a Purple Heart and an Oak Leaf cluster, meaning he was wounded twice. He never told his family. In France, he made a single handed capture of three German officers in a small village. Exactly how he did it we do not know. What we know is he was awarded a Bronze Star for this action on July 26, 1944. He rarely talked about the Bronze Star. 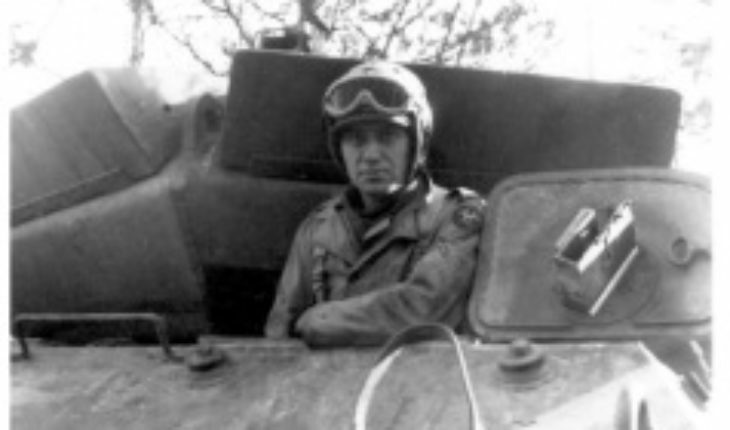 Somewhere in France he was able to find his brother Ray, who was with Patton. How he found his brother we never learned. In Paris he somehow commandeered a truck full of cigarettes. Don’t Ask Don’t Tell had already started. His top rank was Sergeant, although the few pictures we have of him in uniform show him with corporal insignia. He was with Company D, 25th. Tank Battalion which was part of the 14th Armored Division, known as the Liberators. He was discharged from the Army in September, 1945. His sister Ruth, who was working at Fort Dix in New Jersey, was waiting for the bus to come and bring her brother back. Ruth was with us on Sunday. Bernie had sent her his Purple Heart decoration, but asked that his mother not be told that he had been wounded. The Jewish War veterans participated in the ceremony for Bernie, saluted, played taps, and presented the flag placed over the coffin to his widow, Ina. When Bernie came home he worked as a butcher for his parents who owned a small store in one of the declining neighborhoods of Camden, New Jersey. Later on, Bernie bought a tap room (a bar), as they were called in New Jersey, and worked extraordinarily long hours. The neighborhood got more and more dangerous -truly Camden was, by then, an urban war zone. Bernie stayed at it -it was how he, along with Shirlee, worked to make sure their three children could be successful, have a good education, and do better than they did. Because the kids were already in bed when Bernie came home at night, he put aside Sunday for the family day. He and the family always did something on Sunday, even if it was a simple drive in the car and an ice cream sundae or milkshake. Inexplicably, Bernie did not like chocolate. Butterscotch was his favorite. Bernie did not wear any of this on his sleeve. He was like many, many others of America’s Greatest Generation. There was a very strong affection that sons like Bernie had for their parents. What they did and saw in World War II stayed away from their parents, their wives and their children. To tell of the terror, the fear and the horror was, for them, impossible. Bernie, as I said, was a quiet man. He lived a quiet life. He was always on the side of his family, and did what was in his power to do, which is why they loved him so much. He had a long life, and a good one as he would measure it. He served his country well. There are many like Bernie, I am sure. We will miss Bernie and all the others. I hope we won’t forget what they did for us.